House hunters can be very demanding, fussing over any little shortcomings. They wouldn't have to look at these houses. A previous owner badly wanted another bathroom upstairs and didn't care much where. 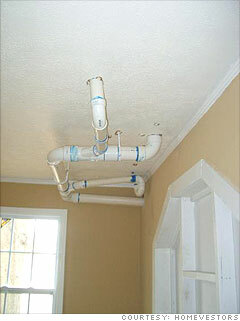 The result: Discharge and water pipes come out from the living room ceiling. Maybe guests would consider the pipes a conversation starter. Maybe not.